Joined a outdoor group Maji Hiking to Isle of Wight (4 miles from the south coast of England) in August. This was my first hiking and camping trip ever! 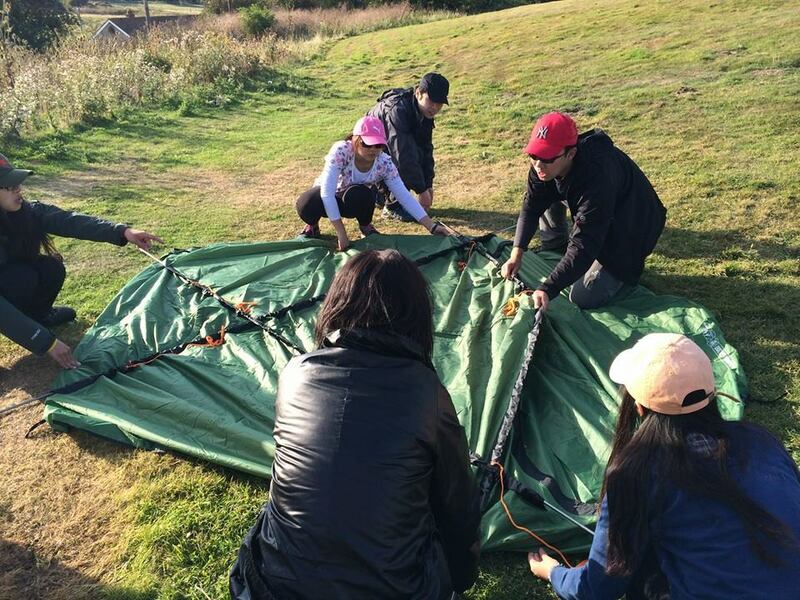 We spent 3 days hiking on the island and slept in tents at night. 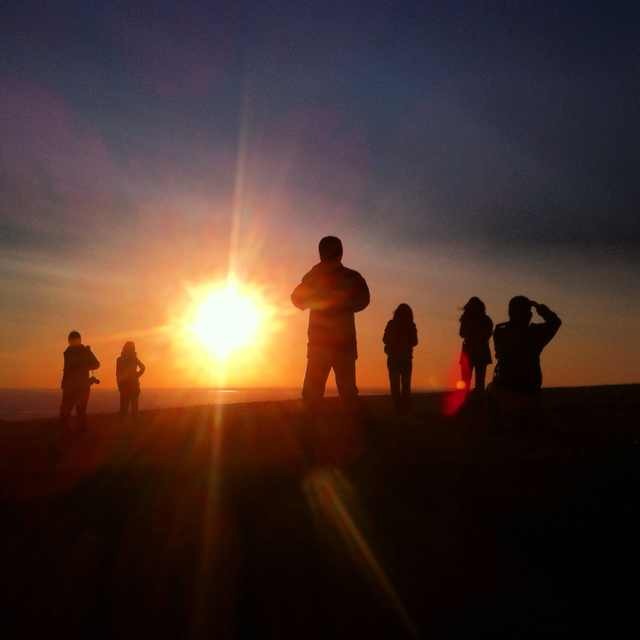 It was an amazing trip: the wild landscape, the beautiful scenery, the calming seaside, the astonishing sunset, the challenging hiking and new-to-me camping were imprinted in my memory since then. I wrapped all the experience and beauty of Isle of Wight home with me by installing them into souvenirs. 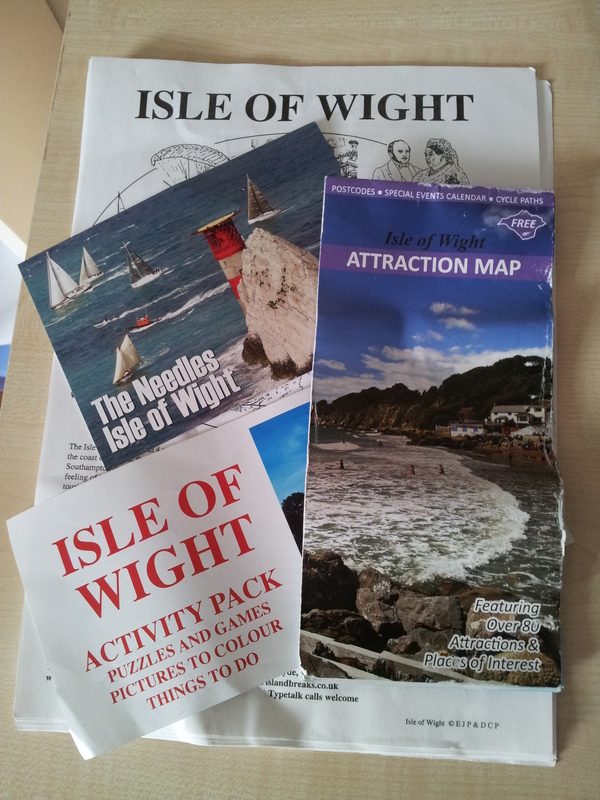 I have an free Isle of Wight Attraction Map taken from a bus stand in Ryde, where we got off the boat from Southampton. This map gave us a general idea of the island and the hiking route we were going to take in the following days. I remember when the hiking leader showed me the hiking route on this map, I took a very deep breath! We took a bus from Ryde to Newport, and on the bus I got a free Isle of Wight Activity Pack, which has a thoroughly introduction to Isle of Wight, from history to geography, from economy to tourism, from activity to birds found on the island. The next day, waking up at 7, can’t feel my eyes and my legs… After breakfast, we walked to Alum Bay to see the Needles from east side (yesterday we were above the Needles on the chalky soils) and enjoyed the rocky seaside (a friend took one rock with him as souvenir). 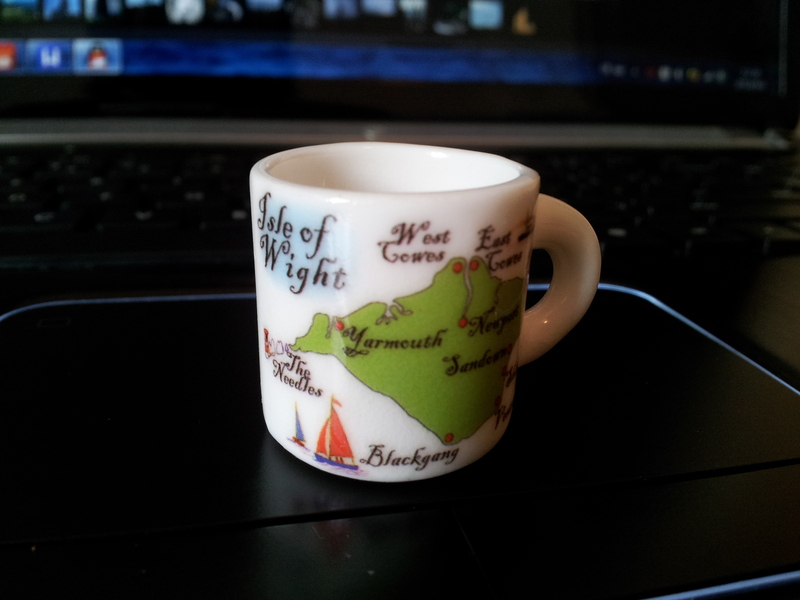 Had a great time in the Needles Park and got a souvenir: the Isle of Wight fridge magnet mug in the Needles gift shop. After lunch we took bus ride (can’t remember how long it was but pretty sure it was very long!) to Feeth Bay in the southeast, and then started walking again. It was 1 o’clock. Half an hour later, we arrived at St Catherine’s Lighthouse, which was hiding in some woods near seaside. 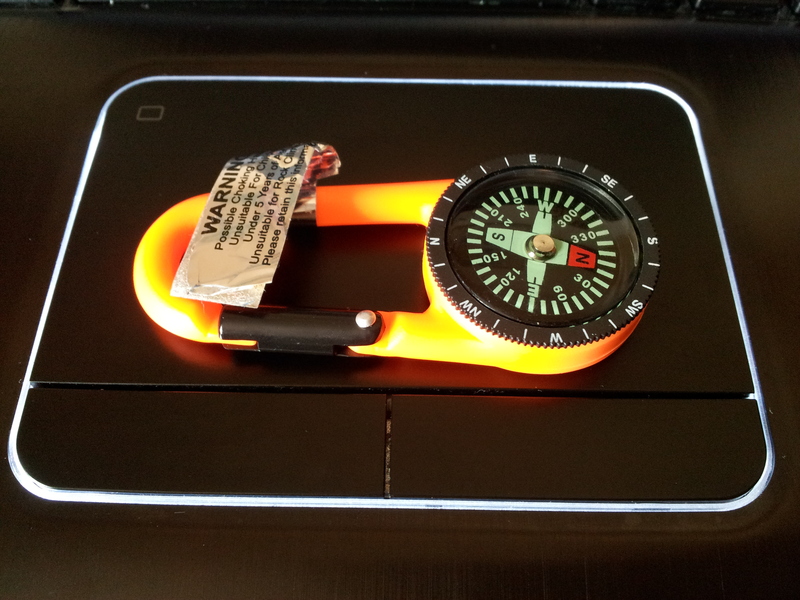 I got my their souvenir here: the St Catherine’s Lighthouse compass. 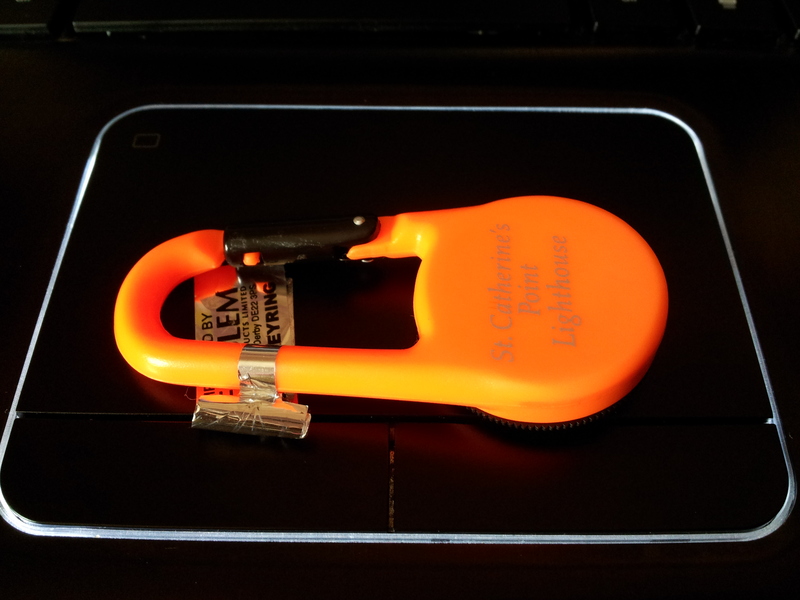 Had an interesting conversation with the shop keeper from St Catherine’s Lighthouse gift shop. Me: Oh, they are nice postcards. Me (looking at the compass): You have compass here! Were looking for one. Shopkeeper: Yes we do, there are many hikers here and they like outdoor products as souvenirs. And they are not expensive. Just one pound. Shopkeeper: Where are you from? Shopkeeper: Ha, then it probably will go back to China with you. Me: Is it made in China? It has got the name St Catherine’s Lighthouse printed on its back. Shopkeeper: Yes it is, and what else isn’t? You know China have produced most of the products for the world. But this is a very good compass. It is oil filled which makes it move freely. Me: And it has the place’s name. Ok, I will take it. we spent 10 hours on the way and arrived at camping site at 11 pm. 10 hours walking and sightseeing, I fell in love with this beautiful, lovely little island. At 8 pm, after 7 hours of walking, we were hungry and nearly gave up. The idea of catching a bus or calling a taxi came up and then finally killed by our spirits. 23-25 August on the island was a great time. I have the magnet mug stick on the fridge in our flat among with other magnets from other places. One month passed, whenever I looked at these souvenirs, I remember the great times on Isle of Wight and want to go hiking again!